The "distance" or "minus power" glasses routinely prescribed accelerate this process by causing the world to appear closer. This causes the eyes to exert more focusing effort, resulting in even more myopia. Stronger glasses are prescribed again and again, creating a vicious circle of increasing myopia. This often leads to detached retina, macular degeneration and even blindness. Consequently, distance glasses should not be used for close work, only for distance. Most eye doctors do not reveal that the glasses they prescribe are harmful to our eyes. There are now over TWO BILLION nearsighted people in the world, made that way by their eye doctors. By 2050, it is expected that myopia will be the leading cause of blindness. Myopia can be prevented by the use of "plus power" reading glasses. << Move cursor onto the image to the left to see what a myopic person sees. or see the animation on our YouTube. 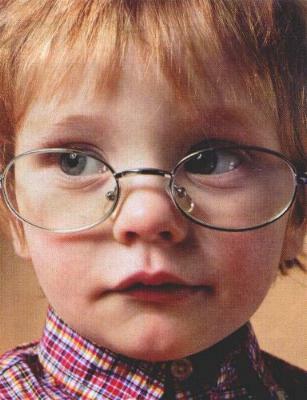 This child's good vision has been DESTROYED . . .
. . . BY THE FAMILY'S EYE DOCTOR! AND THE ODDS ARE THAT SOMEONE IN YOUR FAMILY IS A VICTIM OF THIS TRAGEDY. Note: This child is no longer wearing sight-destroying minus lenses. He is using sight-saving plus lenses for close work. There are many frauds in the world, engineered by greedy, unscrupulous people. Getting shoddy goods, or losing one's money entirely is common. But what about a situation where you lose your money and your most precious gift, your vision, at the same time? And what if this is happening to defenseless children in every country of the world? Over one third of our children, although born with normal vision, become nearsighted during their school years. Many have vision that has deteriorated to the point where they would be declared legally blind if they did not have the crutch of glasses to turn to. In some highly literate Asian countries, the incidence of acquired myopia has been increasing in recent years to the point where over 90% of college students are nearsighted! The eye doctors claim this is hereditary, even when there is no history of the problem in the family. But, of all our senses, why is it just our vision that so rapidly deteriorates at such an early age? What if one third of our children walked around with hearing aids or crutches? Would that be considered just "inherited"? The excessive amount of reading and other close work that we do in our modern society is the REAL cause of acquired myopia. And the glasses with minus power lenses that are normally prescribed by uncaring doctors make the vision get worse FAST! Today there are about 100 million young children entering the school systems of the world each year. Under current conditions, the poor visual environment and ignorance about prevention will probably lead to an extra million or so people becoming blind each year, as a predictable effect of excessive myopia derived from this harmful school enviromment. Are you concerned about what your children view on the Internet? You should be more concerned about HOW they are viewing it. If they are wearing the glasses normally prescribed for myopia, their vision will deteriorate. If you ignore the information on this site and fail to educate yourself, you are a partner with your eye doctor in creating a visually handicapped child. The expense and nuisance of wearing glasses for a lifetime is the least of the problem. The more myopia you have, the more you are at risk for sight-destroying diseases such as retinal detachment, macular degeneration, glaucoma and cataract! During the last century, over 160 million human beings were slaughtered in warfare by other human beings. Compassion toward others is hardly a predominant human trait. This same lack of concern for others is also widespread in the business world. We all know how the tobacco industry does everything in its power to make our children into tobacco addicts so that they will become lifelong customers. The misery and death caused by this are of no concern. In a similar way, the eye "care" industry intentionally ignores prevention so that our children will become lifelong customers. That the progression of myopia leads to eye disease and blindness is of no concern to these people. It's all about the money. This is CHILD ABUSE at its worst. Minus lenses used for reading. Many parents ask "Why does my child need glasses?" 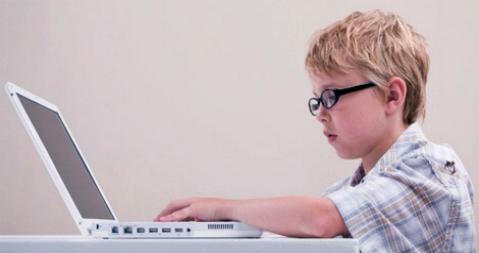 On this website you can learn about and obtain the information and tools that you need to prevent myopia. But eye doctors and optical companies do not want you to know about these things that they fear and suppress. They do everything in their power to hide this knowledge from you. Now, thanks to the Internet, you are no longer at the mercy of your doctor's IGNORANCE and $ELF-INTEREST. For a detailed analysis of how the public is being deliberately misled, see The Conspirators. Take the logical tour of this site through pages 2, 3 and 4 by clicking on PAGE 2. This tour includes links to all the pages listed below. Or, use the shortcuts below to visit any individual page. Awards, Principles and "Truth on the Internet"
The Defenders Of "Business as Usual"
This site is brought to you by the International Myopia Prevention Assn., Ligonier, PA 15658. President - Donald S. Rehm, author of The Myopia Myth. See links to other informative websites below.